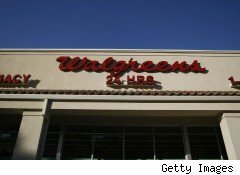 Drugstore chain Walgreen (WAG) is looking to sell its pharmacy-benefits management (PBM) business and has hired Bank of America to run an auction, Bloomberg and Reuters reported, citing unnamed sources. PBMs, which administer prescription drug benefits for employers and health plans, make money by negotiating prices with retail pharmacies and drugmakers and processing a large number of claims. The unit is expected to fetch between $300 million and $500 million, sources told Reuters. But Bloomberg sources said the unit could get between $500 million and $1 billion, depending on what assets are included in the deal. Deerfield, Ill.-based Walgreen received first-round bids last week. Among the companies expressing interest were the three largest PBMs in the U.S.: Medco Health Solutions (MHS), Express Scripts (ESRX) and CVS Caremark (CVS). Analyst Andrew Wolf of BB&T Capital Markets explained that purchasing PBMs, which compete on price to win contracts and gain market share often at the expense of margins, are a way to gain market share without hurting margins, Bloomberg reported. While CVS Caremark seems intent on continuing the model of combining retail and PBM, Walgreen has said it would rather focus on its core retail and health care services business than process claims. The largest drugstore retailer is expanding its retail and worksite medical clinics, as well as its specialty pharmacy, home health care, infusion and respiratory therapy businesses, Bloomberg added.